THEN was published in September 2016 with a list price of $22.50 (trade paperback) or $36.50 (hardback, discounted by 10% as an introductory offer). There is also an ebook edition. Ansible Editions is happy to announce that Then won the 2017 Fanzine Activity Achievement Award in the category of Best Special Issue. Rob Hansen is acknowledged in Brian Aldiss's autobiography The Twinkling of an Eye as "the historian of fanzines". 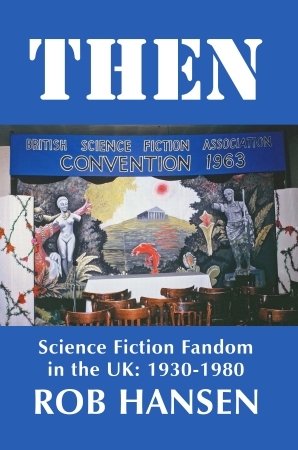 Then is Rob's ground-breaking history of British science fiction fandom from its first stirrings in the early 1930s to 1980 and a little beyond. Originally published in four fanzine-format volumes from 1988 to 1993, this first book edition of Then is now greatly revised, corrected and expanded by more than 40,000 words to give a massive trade paperback – and a simultaneously published hardback – running to 454 pages and nearly 228,000 words. Besides the results of much new research, Then includes over 300 photos of contemporary fans of all eras, dozens of scans of representative fanzine covers selected from each decade, detailed source notes and a full index (not to mention a separate photo index). This first book edition of Then also has an appreciative introduction by Peter Weston, who writes: "without Rob we would know almost nothing about British fanhistory, whereas thanks to him we know just about everything ... It's a truly amazing thing, and something of a minor miracle that it ever came to be written." The ebook edition includes the index, with index page numbers linking to appropriate pagebreak positions in the text; note numbers in the text link to relevant endnotes in the Source Notes section; all photos and cover scans are included and indexed with links. Cover photo: Convention hall and stage backdrop at BULLCON, the 1963 UK Eastercon. Photo by Bruce Burn. All the photos and scans can be viewed online in the Then Photo Gallery, at larger than printed size. Many unused alternative photos are also included.